HOUSTON -- Dallas Keuchel picked up right where he left off on Saturday night in his return from a short stint on the disabled list. 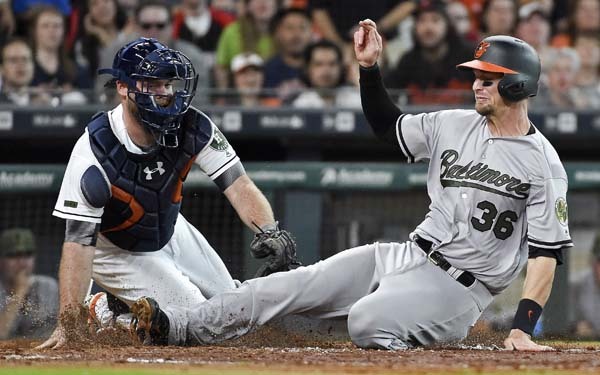 Keuchel (8-0), who missed one start with a pinched nerve in his neck, allowed four hits and one run while fanning eight in six innings to lead the Houston Astros to a 5-2 win over the Baltimore Orioles. "It was pretty flawless," manager A.J. Hinch said. "We couldn't have asked for much more. He was extremely sharp with getting outs." His eight wins this season lead the majors and he's just one win away from matching his total from last year, when he struggled in the follow-up to his stellar 2015 season during which he won 20 games and the American League Cy Young Award. "I felt good," he said. "So hopefully take the next step and continue to progress and get back to hopefully seven or eight innings." Will Harris struck out two in a perfect ninth for his second save. Houston led by 1 in the fourth before George Springer hit a two-run homer off Wade Miley (1-3) to make it 4-1. Welington Castillo had an RBI single for the Orioles, whose season-high skid reached six games. "There's just too much talent to struggle for too much longer," right fielder Mark Trumbo said. "It could be tomorrow, it could be the next series, but we're going to start to do better." 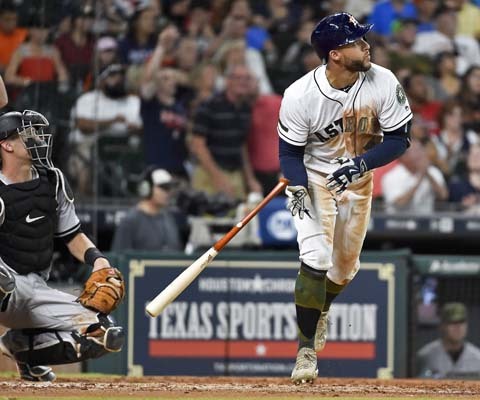 Jose Altuve had three hits and an RBI and Carlos Correa added two hits and drove in a run for the Astros, who won for the fifth time in six games. Miley tied season highs by allowing eight hits and four runs in five innings to remain winless since April 14. 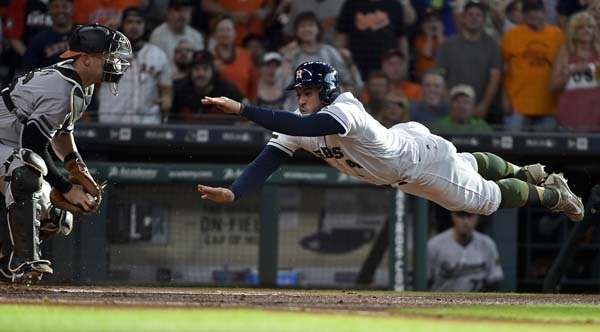 Springer put Houston up 1-0 in the first when he made a diving slide to evade the tag at home and score on a double by Altuve. Correa followed with a single to send Altuve home and push the lead to 2-0. The Orioles got going in the third inning when Caleb Joseph walked with two outs. Joey Rickard singled before Joseph scored on a single by Castillo to cut the lead to 2-1. 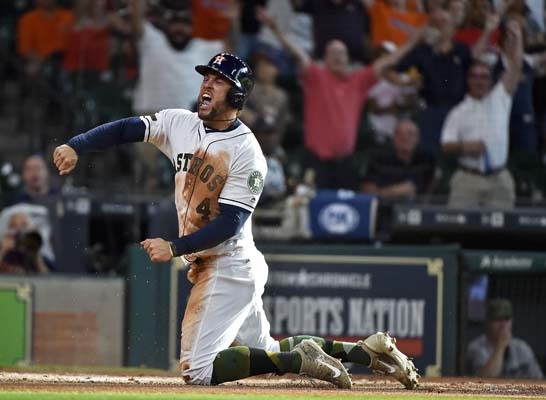 Alex Bregman singled with one out in the fourth before Springer hit his 10th home run on a towering 447-foot shot to center field with two outs to extend Houston's lead to 4-1. Orioles: CF Adam Jones was out of the lineup on Saturday and expected to miss Sunday's game as well because of a sore ankle and hip. 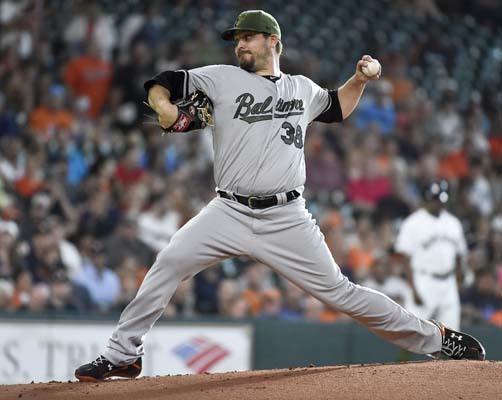 "We needed to back off of him," manager Buck Showalter said. "Hopefully it's only a day or two. We'll see. If it's not better in a couple of days, we'll see if we need to take another step." Astros: C Brian McCann was activated from the 7-day concussion list before the game and returned to the lineup. He went 0 for 2 with two walks. The Astros will start Brad Peacock on Monday against the Twins and move Mike Fiers into the bullpen. 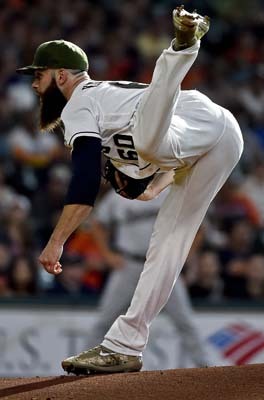 Peacock allowed one hit and struck out eight in 4 1/3 innings in his first start of the season while filling in for Keuchel when he was injured. He's 2-0 with an 0.87 ERA in 13 appearances this year. Fiers has struggled this season, going 1-2 with a 5.21 ERA in nine starts. Hinch said he isn't sure if he'll stick with this rotation past the Minnesota series. A small black bird was on the infield for most of the seventh inning. It sat between home plate and the mound for a while before flying over and landing near third base. It was then that the Astros showed the bird on the Jumbotron with the words "rally bird" below it. Baltimore third baseman Manny Machado then walked near the bird and tried to shoo it away, drawing loud boos from the home crowd. Soon after that, the crowd began chanting "Rally Bird!" repeatedly before it finally flew off the field and perched on the net above the Orioles' dugout. 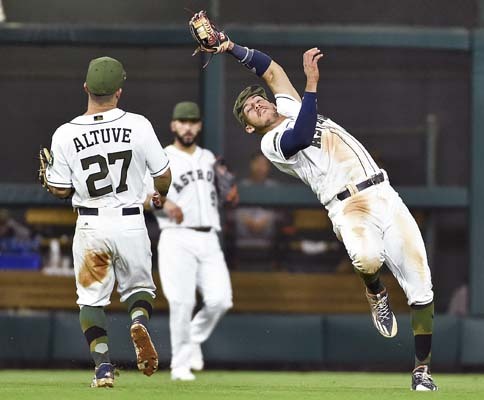 "We're playing the Orioles, we're playing the birds and they decided to strike up a rally bird," Springer said. "That was clever. I liked it." Orioles: Alec Asher (1-2, 2.17) who has spent most of the season in the bullpen, will start for Baltimore on Sunday. Asher is taking the place of struggling right-hander Ubaldo Jimenez, who was moved to the bullpen after posting a 7.17 ERA in nine games. Asher hasn't allowed a run in his last four appearances. Astros: Lance McCullers (5-1, 2.43) is scheduled to start for Houston on Sunday. McCullers allowed one hit in five scoreless innings in his last start to extend his streak of consecutive scoreless innings to 22 innings, which is the longest active streak in the AL.